Indecision remains the order of the day. Depending on your perspective, the SPX is either perched on a knife-edge (or at least, the neckline of a head and shoulders pattern) or drifting aimlessly. To be sure, for a while yesterday it looked as if the knife edge was going to win by TKO, but Bill Dudley was evasive enough that the follow through was non-existent. One can almost imagine him checking screens before delivering his briefing, seeing the SPX down 15, and hastily editing his comments. That's a joke (in several meanings of the word), but is also uncomfortably plausible as well. The upshot is that SPX cash closed bang on the neckline, so the margin for error remains fairly thin. Overall, Dudley's comments were fairly anodyne. Sure, he said that June was a live meeting, but he could hardly indicate otherwise after Wednesday's minutes without making the Fed look very foolish indeed. More on point, while he repeated a number of the sentiments expressed in the minutes, he offered little by way of value judgement as to whether the time for another tightening was imminent. Like the Spooz, the power brokers at the FOMC are keeping their options open. What we can say is that the rally, while moderately impressive in terms of magnitude, was less vigorous when looking at the volume that drove it. 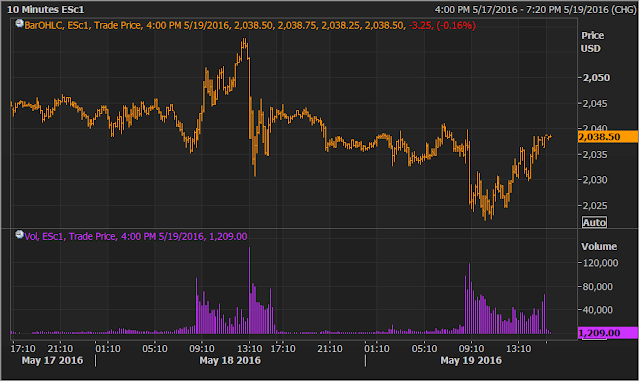 Indeed, much of the uptick came during the lowest volume portion of the day, suggesting that (quelle surprise!) algos were likely behind the buying. One market that did break was silver, which crashed through its little neckline and didn't look back. Even in the precious metals complex, however, there was indecision. Sure, gold was down on the day, albeit much less so than silver. But even when stocks were at their nadir and the dollar at its apex, GDX was somehow in positive territory, where it remained for the rest of the day, closing up more than 2%. It's not exactly screaming out "secular trade" here, is it? With today's weather forecast looking sublime, it's going to be awfully tempting to put the indecision to one side for one day and turn the screens off. To be sure, we're all in the business of trying to forecast the future...but sometimes when you search too hard for an augury, all you end up is a fistful of chicken entrails. Chow!, move on. See ya Pal. MM, suggest that you might devote a quiet day to perusing some IWM charts. The broader market presents a more bearish backdrop than the Spooz and it might be fun to compare the two from a technical perspective. We have been following IWM for a long time and it is clearly much farther along in the rolling over process. As such, it's our favorite target for any trades involving equity shorts. The tiger always attacks the weakest antelope.... once it's down, the hyenas come in and pick over the carcass. seems equities are expecting something from the G7 meeting over the weekend. But if reality fails the expectation we will just see what LB suggested as the sell in May coming on Monday. "From the U.S. standpoint, they may say the yen was at 70 yen or so until recently. That was natural for them. They are facing elections, we are facing elections too, and both have [Trans Pacific Partnership, reference to the recent trade deal that is awaiting approval by U.S. Congress]. It is our job to make statements. We must prevent such differences of opinions from becoming emotionally complicated by exchanging opinions." @Cityhunter - I frankly doubt the perma-bull tyoes give a gnats behind about what happens at G-7, but the above statement is from the Japanese finance minister, not a commentator from zero hedge. Lets just say score 1 in favor of the crowd that claims the currency wars are far from over, and that japan was the angry gimp in the stealth shanghai accord. That 2030-2040 neckline on SPX is looking very enticing and there could well be a waterfall break when it does occur. I added to short at the end of Friday. If it breaks, I think it will quickly go to 1800 again. It is probably a better setup short from here than, short @2100 2 weeks ago. Everything is well lined up in terms of fundamentals, technicals and seasonality. The question is where it could still play silly buggers and rally to early next week ? 2070. The chances of reaching new highs seem low so a stop around 2100 seems reasonable. A good starter position here would be nice to pyramid from the neckline break. The only problem I see is that it looks too obvious. My reading on FX charts suggests that commodity currencies such as AUD is subject to a rebound. Not sure if it matters. But the next weekend is a long weekend, so be careful of the short term profit taking.